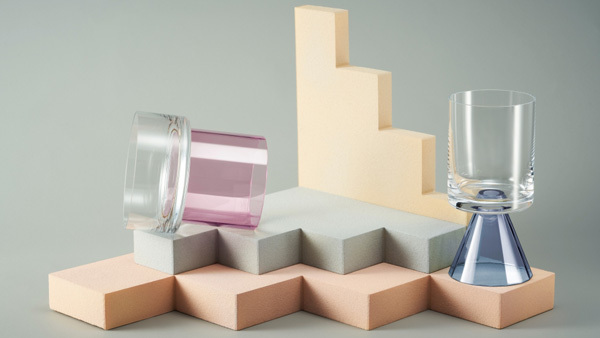 Under a new brand label, Krosno D’sign, Polish glass manufacturer Krosno Glass has partnered with award-winning visionary designer Karim Rashid on a collection of drinkware and decorative pieces. Born in 1960, Karim Rashid, is an Egyptian-born and Canadian-raised industrial designer. He has won the Canadian designer of the Year in 2001, a silver award from the Pentawards in 2010 for a collaboration with Box House, the Red Dot Design Award in 2012 for his collaboration with Danish designer and manufacturer BoConcept on their Ottowa Collection and the Lawrence Israel Prize by the Fashion Institute of Technology in New York City in 2017. Based on the sacred geometry of forms, Karim created his glass sculptures using the perfect, pure symmetry of cylinder and cone, the forms he considers most universal. Sakred is a limited handmade glassware line, in a variety of Karim’s vibrant signature shades (yellow, purple, green and pink) including a flute, martini glass, wineglasses, whisky glass, highball, carafe, dessert bowl, cake stand/dome, fruit bowls, candleholders, vases and hurricanes.